Figure 1: Europe. In red, village of Étalle, Belgium, location of the latest report of African swine fever. This new outbreak may represent a new change in the epidemiologic situation of ASF worldwide, suggesting that the disease may have reached pandemic proportions. Although it has not been officially reported to the World Organization for Animal Health, preliminary reports indicate that African swine fever has been confirmed in two wild boars near the southern village of Étalle, in the province of Luxembourg, which is located 8 miles (12 km) from the border with France and 11 miles (17 km) from Luxembourg. It appears to have jumped a considerable distance from previously affected countries, about 300 miles (500 km) from the border with the Czech Republic, 500 miles from Hungary, and 750 miles (1,200 km) from the border with Romania (approximate distances). Belgian authorities report they are working to prevent the possible spread of the disease among wild boar and onto pig farms. In 2017, Belgium exported $1.4 billion of pork, making it the eighth largest pork exporter by country, and it is unclear how trade within the European Union will be affected. Following the report, the French Minister of Agriculture called for “an adequate response given the considerable economic interests at stake for the French agri-food chain” and warned about the impact of the Belgian outbreak, calling on officials to stop the disease from spreading across the border. ASF has been spreading through Eastern Europe, mostly associated with transmission through wild boars, a population that has been growing in Europe over the last decade. This new outbreak represents the expansion of the disease, for the first time during the current pandemic, into Western Europe (Figure 1, see above). This is also the first time ASF has been diagnosed in Belgium since 1985, when 12 farms were infected and 60 farms (34,041 animals) were eliminated. A recent modeling exercise on the potential spread of ASF in Belgium suggested that, in most of the cases, the disease would be controlled before any spread. However, if ASF virus was introduced into commercial farms, the median number of infected farms was predicted to be six (see Simons et al at the References section). Figure 2: Europe. In red, Belgium, location of the latest report of African swine fever. 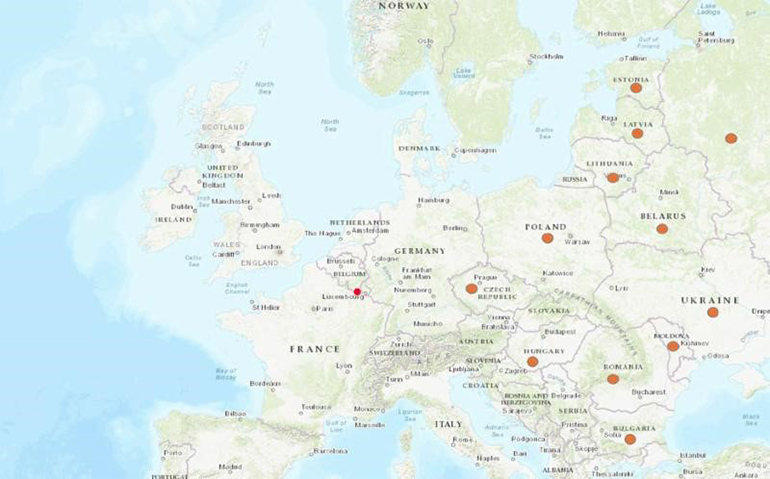 In orange, European Countries that have reported ASF in this current pandemic of the disease. This new outbreak may represent a new change in the epidemiologic situation of ASF worldwide, suggesting that the disease may have reached pandemic proportions. “Pandemic” is a term that refers to “an outbreak of a disease that occurs over a wide geographic area”, which seems appropriate in this case, considering ASF’s expansion across Europe, and over considerable distances in China over the last year, in addition to the sustained occurrence of outbreaks in Africa and Russia. • Biront P, Castryck F, Leunen J. An epizootic of African swine fever in Belgium and its eradication. Vet Rec. 1987 May 2;120(18):432-4.